Single rechargeable lithium-ion battery for use with Synergy® 7.4v jackets and vest featuring push button control and LED charge status indicator. Single rechargeable lithium-ion battery designed for use with Synergy® 7.4v gloves. Two batteries are needed for gloves. Wall charger to recharge a Synergy 7.4-volt lithium-ion battery used in Synergy 7.4v jackets and vests. Wall charger to recharge Synergy 7.4-volt lithium-ion batteries used in Synergy 7.4v gloves. Charger for recharging Synergy 7.4-volt lithium-ion batteries from a 12-volt sock in your vehicle or bike. 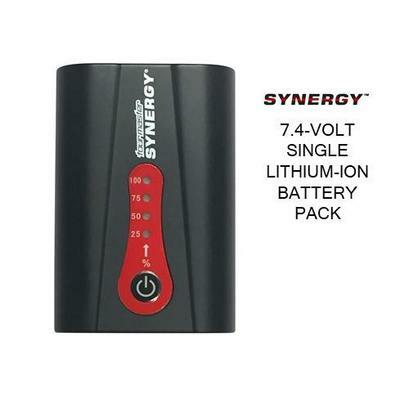 For use with Synergy® 7.4v product where necessary to extend a battery connection.